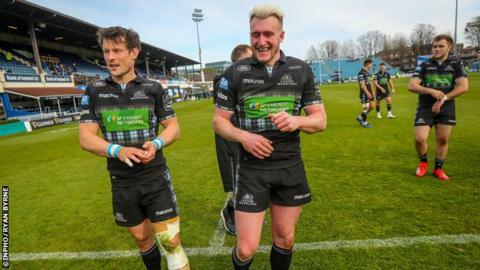 Glasgow Warriors' Pro14 win over Leinster was a "big moment" in their season, says head coach Dave Rennie. Warriors' 39-24 triumph was their first over the defending champions in Dublin since 2011. It moved them back ahead of Munster at the top of Conference A, and a win against Edinburgh next will secure a home semi-final. It was Glasgow's second impressive performance in a week, having demolished Ulster 30-7 last time out, on the back of a chastening Champions Cup exit at the hands of Saracens. They were they were forced to make 307 tackles against Leinster, and Rennie was delighted with his side's resilience. Rivals Edinburgh on April 27 are all that stand in Glasgow's way in their bid to secure a home-semi final, but Richard Cockerill's men have already got the better of them twice this season.